Dr. Liviu Olteanu talked at Palais des Nations in Geneva with Her Excellency Ms. Beatriz Londoño SOTO, Ambassador Extraordinary and Plenipotentiary, Permanent Representative of Colombia at the United Nations in Geneva, on a follow-up to the Global Summit on Religion, Peace and Security hosted in Geneva and where Ambassador Soto moderated a panel and shared important comments on fostering peace and security by supporting the freedom of religion or belief. At the meeting that took place during the Human Rights Council session, new perspectives of collaboration were established between the mission of Colombia and AIDLR on projects that will be launched by the AIDLR at the United Nations. 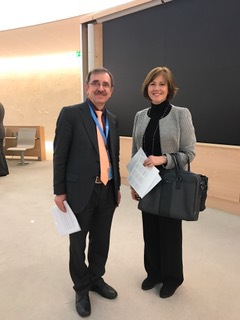 Photo: Her Excellency Ms. Beatriz Londoño SOTO, Ambassador Extraordinary and Plenipotentiary, Permanent Representative of Colombia at the United Nations in Geneva and Dr. Liviu OLTEANU the Secretary General of the AIDLR.